The series consists of records relating to the conduct of municipal elections, including Voter's Lists covering the period from 1973 to 1998 (note that 1994-1997 are missing). 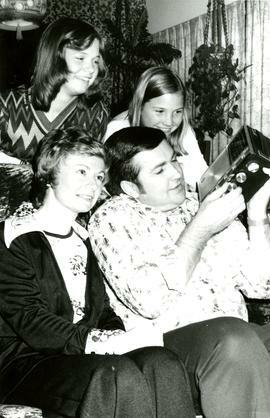 This photograph depicts J.L (Jim) Tonn, wife Gail and daughters Lori and Susan listening to the mayoral election results in 1975. The series consists of one copy of the 1980-1981 Voter's List for the District of Coquitlam. The series consists of Columbian Newspaper clippings and B&W photographs arranged by subject. The files were created by Columbian staff members and accessed to provide information about a given person or subject.